We started by going out to our favorite local pizza places to interview the guys who sell hundreds of pizza slices a day to hungry New Yorkers, and watch how they used their slicers. We recognized that there are multiple hand positions that must be considered, so we designed a multi-position grip that gives the user the flexibility to choose the optimal position for their own preference. In each case, the grip design gives the user good mechanical advantage and also protects their hand from the pizza wheel itself. Most so called “garlic presses” are really garlic “squeezers” because they rely entirely on the user’s grip strength to push the clove of garlic through a grid of holes. The Trudeau Stressless garlic press can be used in that traditional manner, but also is equipped with integral rubber feet designed to be placed against the cutting board for increased mechanical advantage with less fatigue. The shape of the handle allows the user to press the device against the work surface using strength from the arm, not the fingers, and without harming the user’s knuckles or the work surface in the process. The Trudeau Stressless Can Opener is designed to allow the home chef unparalleled ease of use and convenience in opening metal cans. 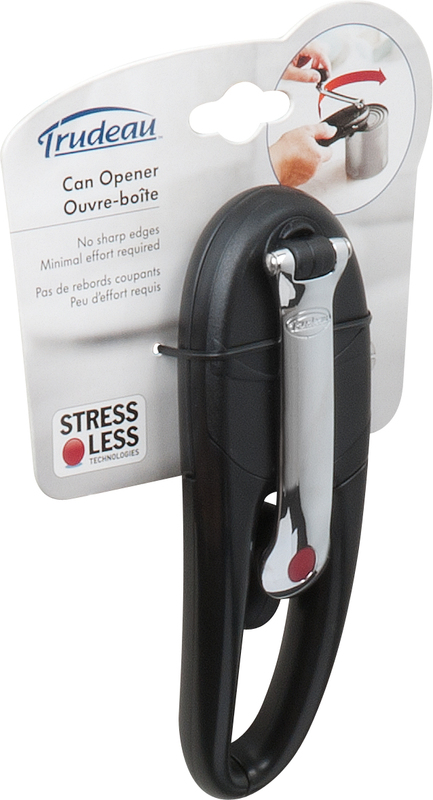 The Stressless Can Opener replaces the stubby twist knob with a long polished metal handle, allowing superior leverage when opening the can, and a continuous, low effort motion that derives strength from the user’s arm, rather than their fingers. The lever arm also folds neatly into the unit for a slim, drawer-friendly profile when stored.